Richard Garnett, Paul J. Schierl/Fort Howard Corporation Professor of Law at the University of Notre Dame, has joined 15 other constitutional scholars in filing an amicus curiae brief in the U.S. Supreme Court’s Little Sisters of the Poor v. Burwell case. The Notre Dame Law School's Program on Church, State & Society is excited to announce that the Program will award up to two Summer Fellowships, in the amount of $10,000 each, for the summer of 2016 to students working for a religious institution in a legal capacity. The International Center for Law & Religion Studies at BYU and the J. Reuben Clark Law Society have just announced their Seventh Annual Student Religious Liberty Writing Competition. Competition details can be found here. 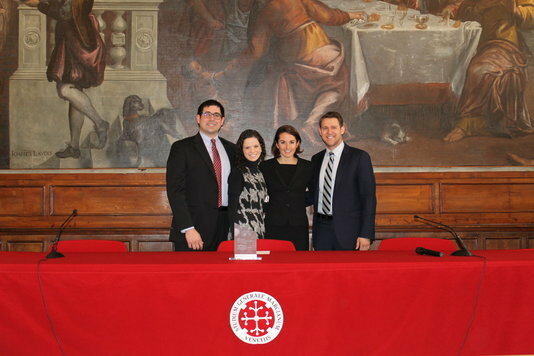 The Notre Dame Law School’s Program on Church, State, and Society sponsored an opportunity for four students to travel to Italy over spring break to participate in the Fondazione Studium Generale Marcianum Moot Court Competition on Law and Religion in Venice. The competition brought together law students from the United States and Europe to argue a case on religious accommodation, and examine issues of religious freedom through a comparative lens.